Note: Gourmet restaurant Lerbach closed in December 2014. The history of the gourmet restaurant at Schlosshotel Lerbach in Bergisch-Gladbach is closely linked to the history of the hotel itself. There has been a country house at this location since the middle ages, that has served as a residence for many wealthy German families among which the legendary Siemens family. In 1992 the country house was converted into a luxury hotel that is now being run by the Althoff Group, who run an impressive collection of luxury hotels, among which the St James's Club and Hotel in London and Hotel Villa Belrose in Saint Tropez. 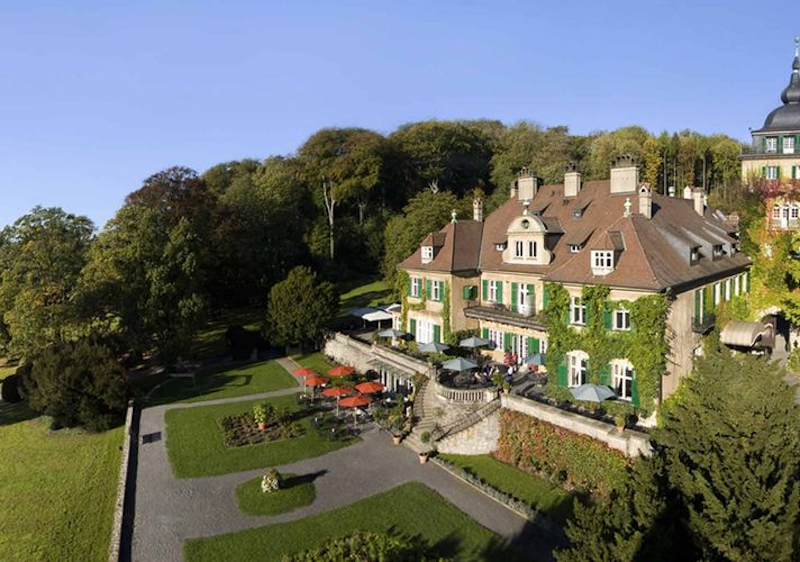 When Schlosshotel Lerbach opened in 1992, La Grande Cuisine also made its entry. Dieter Müller became the executive chef of the then eponymous fine dining restaurant at the hotel. In 1993 the restaurant was awarded its first Michelin star and the second star followed the next year. In 1997 already, the ultimate accolade was bestowed on the restaurant by Michelin. That same year Nils Henkel joined the team at Lerbach as Dieter Müller's sous-chef. Henkel, who had originally studied architecture, received his training as a chef at a number of German restaurants before coming to Lerbach. In 2004 Nils Henkel was appointed head chef and in 2008 he took over from Dieter Müller as executive chef of the restaurant. After Dieter Müller's departure in 2010, Nils Henkel managed to retain the restaurant's three stars, but in the 2012 guide the restaurant lost its third star. 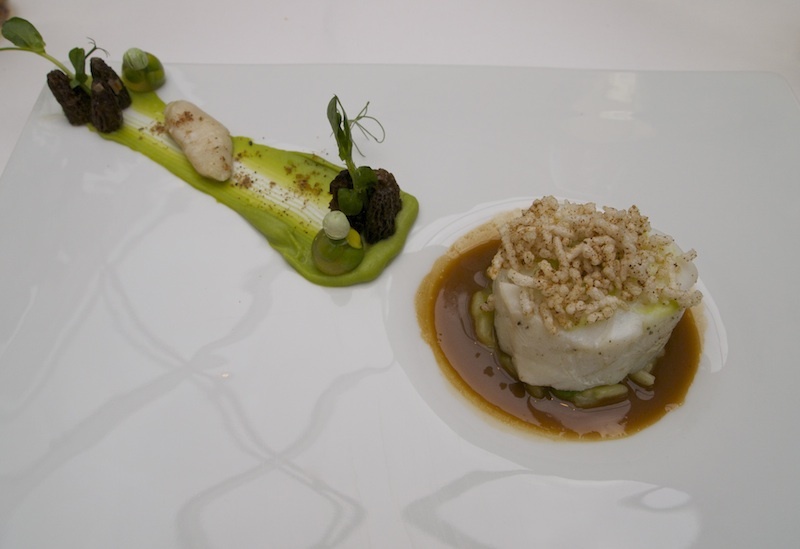 I had last visited the restaurant in October 2005 and the 21-course amuse bouche lunch they served, is still one of the most memorable meals of my life. My return was therefore long overdue. The restaurant is open for lunch and dinner Tuesday till Saturday. Apart from an a la carte menu the restaurant offers several multi-course tasting menus. There's the 'Degustationsmenü' (6 courses €160, 8 courses €185), the 'Amuse Bouche Menu' (18 dishes served in 6 courses for €130), a vegetarian tasting menu (6 courses €125, 8 courses €155) and for lunch there's a 4-course Gourmet lunch menu (including a glass of champagne, water and coffee or tea) for €110. 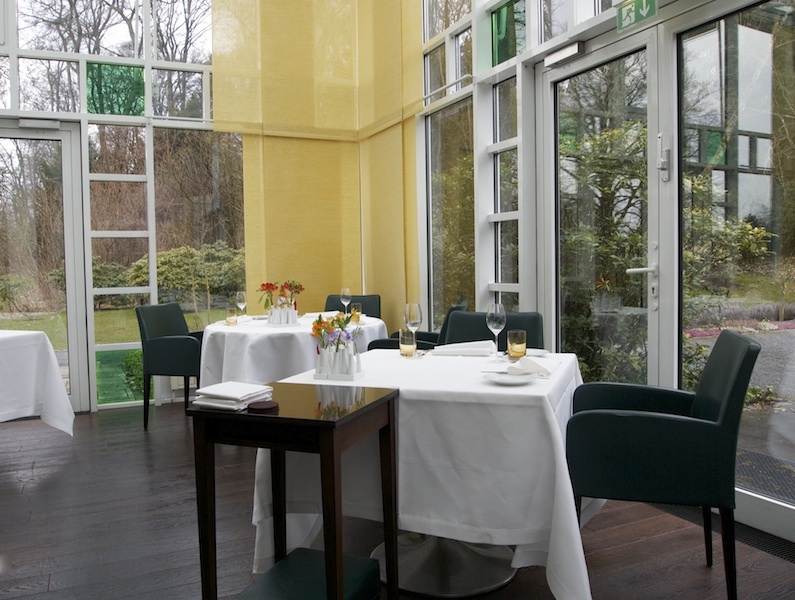 I had lunch at Gourmetrestaurant Lerbach on 30 March 2013 with my husband and we both opted for an 8-course tasting menu. Since this was the Saturday before Easter, the restaurant only had two multi-course tasting menus on offer (in accordance with German custom). 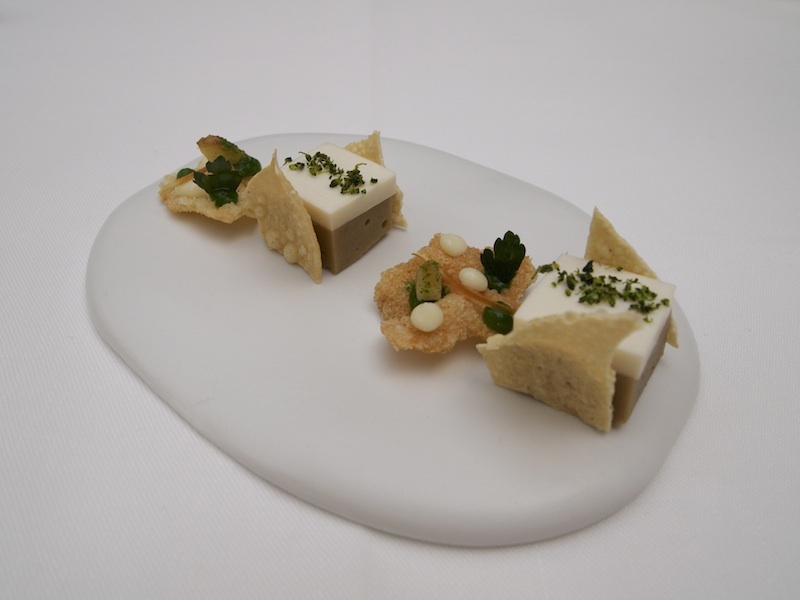 With our aperitifs two canapés arrived: Poppadom 'sandwich' with aubergine and ricotta and a crunchy cracker with different parsley textures. Two nice canapés with precise and pure flavours. The tasting menu started with 3 'sunflower seed' amuse bouches (from left to right): Veal tartare, wrapped in sunflower seed jelly and dots of sunflower seed crème - Grilled cuttlefish with sunflower seed puree and Jerusalem artichoke puree - Braised pig's tail in a crispy coating with a sunflower seed jus and Jerusalem artichoke (fresh and puree). 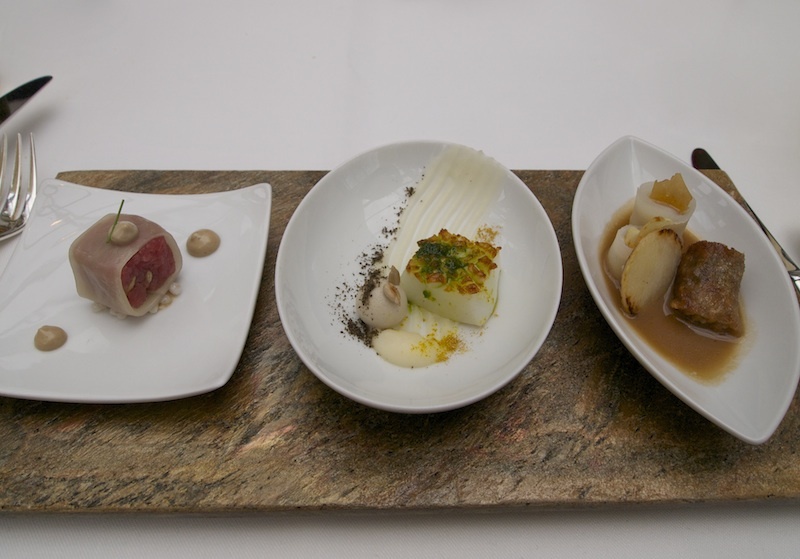 Three wonderful amuse bouches with a lovely build up of flavour intensity. First the delicate veal tartare, then the warm and flavoursome cuttlefish and finally the wonderfully intense pig's tail - I really liked the sunflower seed theme. First course of the tasting menu was Duck foie gras, birch sap, ceps, malted barley and sweet cicely. Delicious duck foie gras terrine covered with a thin slice of cep jelly, topped with wonderfully crunchy cep meringues and some grated foie gras. Then there was this beautiful cylinder of spaghetti-shaped jelly made from birch sap and malted barley essence. 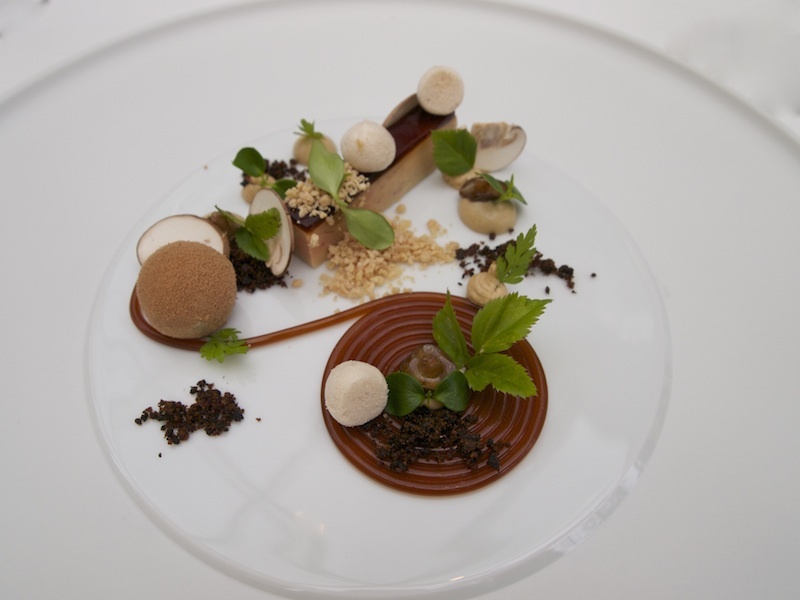 Also on the plate were a few dots of cep cream, sweet sicely leaves, thinly sliced mushrooms (marinated with rosemary) and a gorgeous, light foie gras mousse delicately flavoured with birch sap and cane sugar and dusted with chocolate. A spectacular composition with beautifully balanced earthy forest flavours - as if your were taking a walk in the woods. Very creative use of the seasonal birch sap and the combination of foie gras with birch sap provides a completely new and sensational flavour experience; the seeming weightlessness of the foie gras mousse was incredible. Second course: Iceland cod, morels, Risi e bisi. Beautifully cooked flaky cod, served on top of a creamy Risi e bisi and topped with some crunchy puffed rice. A wonderfully intense mussel sauce was spooned around the risi e bisi. The sauteed cod tongue was served with a lovely fresh and sweet pea puree, two beautifully made jelly bonbons filled with fresh peas and some delicious (first of the season) fresh morel mushrooms. A sublime dish with a beautiful balance between richness and intensity and executed with outstanding attention to detail. Great use of seasonal ingredients too. Third course: Mackerel (from Brittany), cucumber, brown crab, mixed-grain salad. 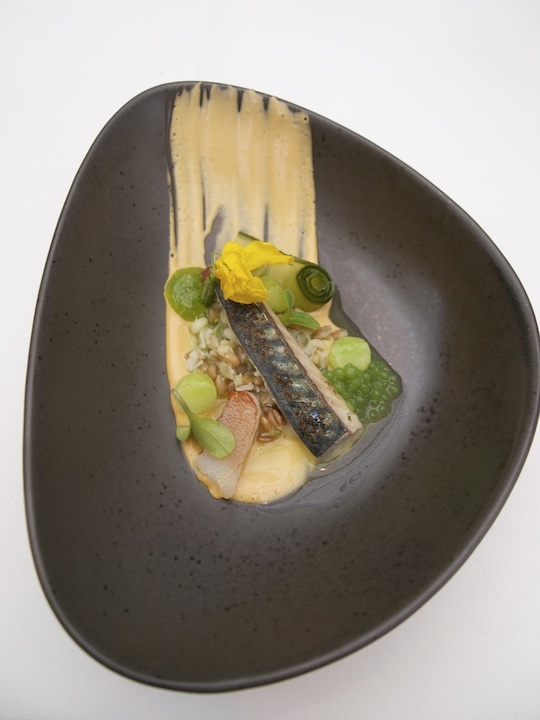 A meltingly soft piece of mackerel served with cucumber in various forms (caviar, lightly pickled balls, jelly and roll) and a very concentrated brown crab crème. The cucumber had nice characteristic German pickling flavours; slightly sweet and with some warmth from the pickling spices, but at the same time lacked some acidity. Also on the plate was a tasty mixed-grain salad that delivered crunch and touch of lightness. A good dish but altogether one that did need some more acidity. Next, the fourth course: Gillardeau oyster, pumpernickel 'Sud', quail's egg, green apple. A lightly poached, fat and juicy oyster and a poached quail's egg served in beautifully flavoured pumpernickel 'Sud' (a light broth) and sprinkled with some finely chopped dried Iberico ham. Lovely fresh finely diced green apple, strips of apple and apple foam. Wonderful depth of flavour and warmth from the pumpernickel 'Sud' and the Iberico ham and a lovely freshness and subtle acidity from the apple. An amazing dish with delicately balanced rich and fresh flavours, the egg adding a nice touch of luxury. Fifth course: Veal heart, wild garlic, broad beans. Tender glazed veal heart covered with a thin sheet of broad bean jelly, sprinkled with some salty bacon crumbs. 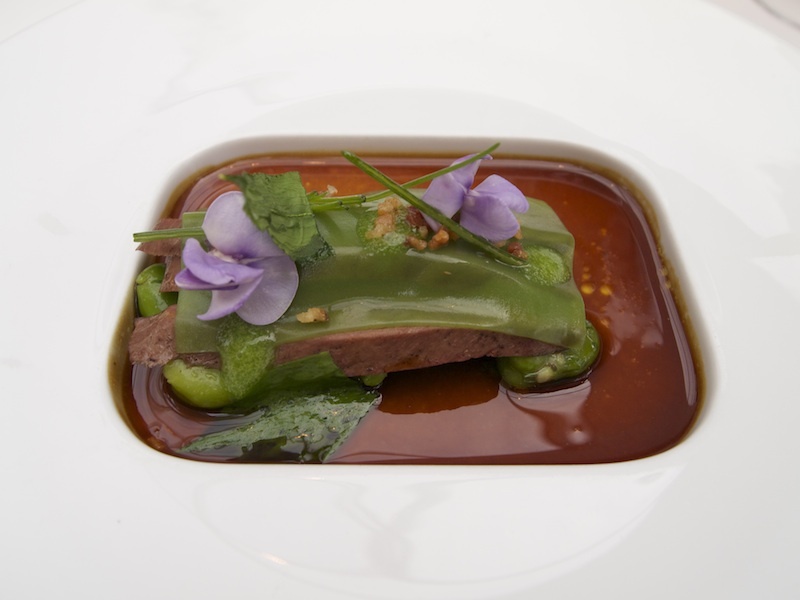 Then there was this well-reduced sauce made from veal jus, fresh wild garlic and a drop of soy and lemon; marvellous! A wonderfully aromatic dish with great flavours and textures. The broad beans delivered lovely fresh and green (but not raw) flavours. 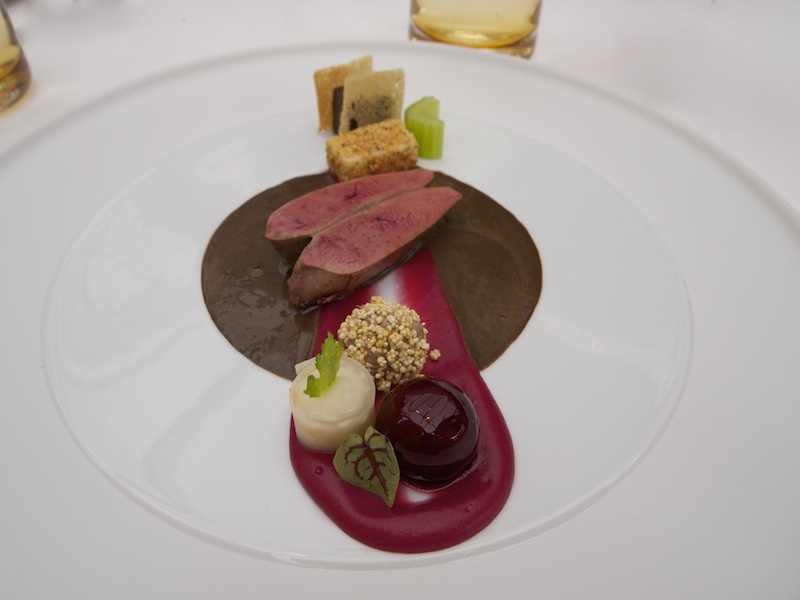 Sixth course: Pigeon (smoked breast + liver), Rouennaise sauce, beetroot, celeriac, celery. Beautifully cooked pink pigeon with the perfect touch of smokiness, delicious smooth pigeon liver crostini sandwich and liver bonbon. But then THE sauce, an absolutely brilliant Rouennaise sauce, a Bordelaise sauce thickened with pigeon and duck livers. Wonderfullly smooth beetroot puree and bonbon, both with the perfect touch of acidity to cut through the richness of the sauce. Also a lovely touch of lightness from the celeriac and celery. The intensity of the Rouennaise sauce was terrific, an elegant richness, magical. An astonishing dish with impeccable flavour and a variety of textures. On to the pre-dessert: Mango, yuzu, coriander, miso. A wonderfully fresh and concentrated coriander sorbet served with some fresh mango, mango coulis and a miso creme and miso cake. An elegant pre-dessert with a lovely balance between sweetness and freshness. 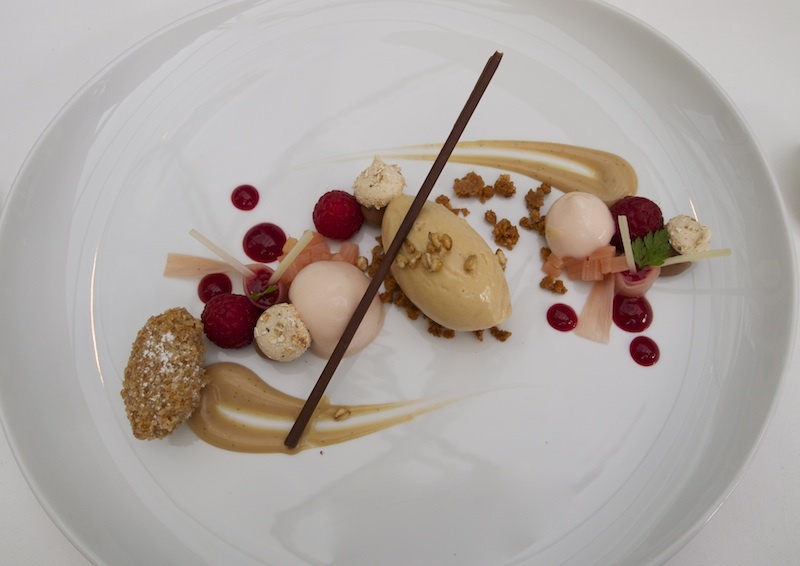 Last and seventh course: Rhubarb, raspberries, oats, Caramélia milk chocolate. Poached rhubarb rolls with a raspberry puree filling, a light rhubarb mousse and chopped poached rhubarb, served with delicious Caramélia milk chocolate ice cream and lovely crunchy toasted oats. The ice cream combined wonderfully with the fresh sweet-and-sharp rhubarb flavours. Also on the plate was a delicious so-called 'Krapfen' with a Caramélia chocolate filling, some caramel and oat crème and lovely caramel and oat meringues. 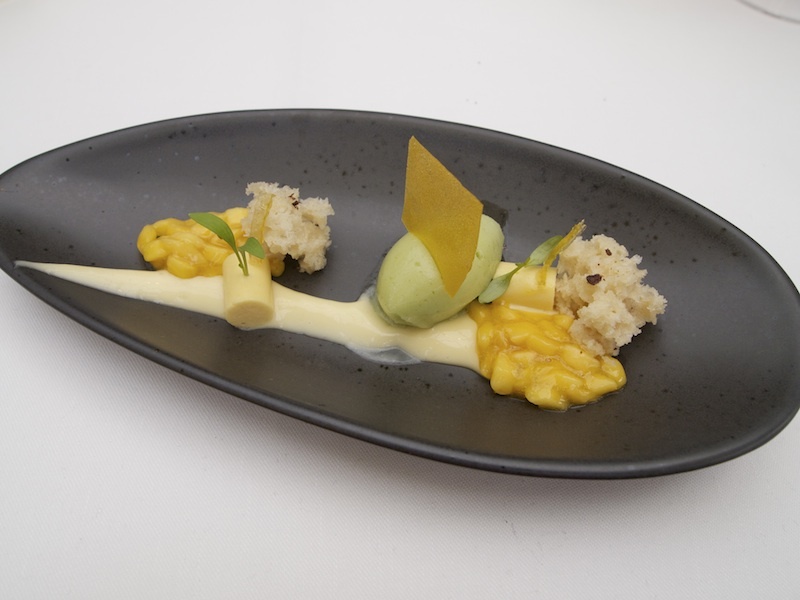 A well-executed dessert with very precise flavours and great textures. Nils Henkel's task is not an easy one. It is very difficult for a chef to succeed a predecessor that was (and is) one of the culinary icons of Germany - particularly when he has played such an important part himself in creating the legend. But it is up to Nils Henkel now to bear the standard of culinary excellence at Schlosshotel Lerbach and he is indisputably doing an excellent job. His culinary programme and philosophy are clearly explained in his book "Pure Nature" and borne out convincingly by the food that he puts on the plate in his restaurant. Nils Henkel is a master of his craft who employs top quality ingredients, both local and foreign, both conventional and uncommon, to create carefully constructed, intricate dishes that have a firm classic basis but do not eschew modernity. Presentation is artful (and sometimes outright breathtaking), the cooking is technically strong, the dishes are complex and beautifully balanced. It is high time that Bergisch-Gladbach regains its rightful position as the equal of Baiersbronn and Bray.